It seems like the Safari team has been pretty busy implementing new CSS properties lately. First out is text-stroke, a new (and non-standard, so not for real-world use) CSS property that can be used to control the fill and stroke colours as well as the stroke width of text. 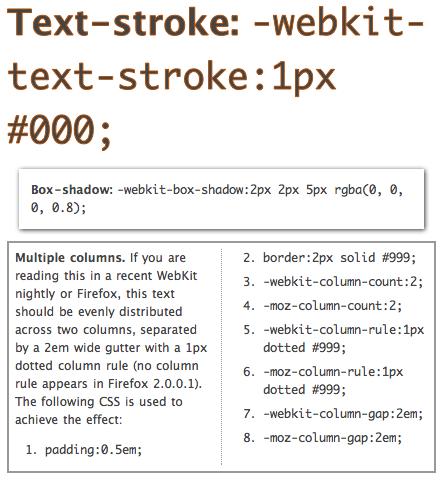 A description and a couple of examples are available in Introducing Text-Stroke. Next is support for the CSS 3 box-shadow property, which lets you apply a drop shadow to a box. It uses the same syntax as text-shadow, which Safari has supported for a long time. More on that in Box Shadow. And the last one (for now) is CSS3 Multi-Column Support, which lets you specify a number of columns that a block will be divided into. Note that Mozilla and Firefox have supported Multi-column layout for some time.